"EVERYBODY FALLS IN THE SUMMER"
alternative ride, interjected by syrupy horns. 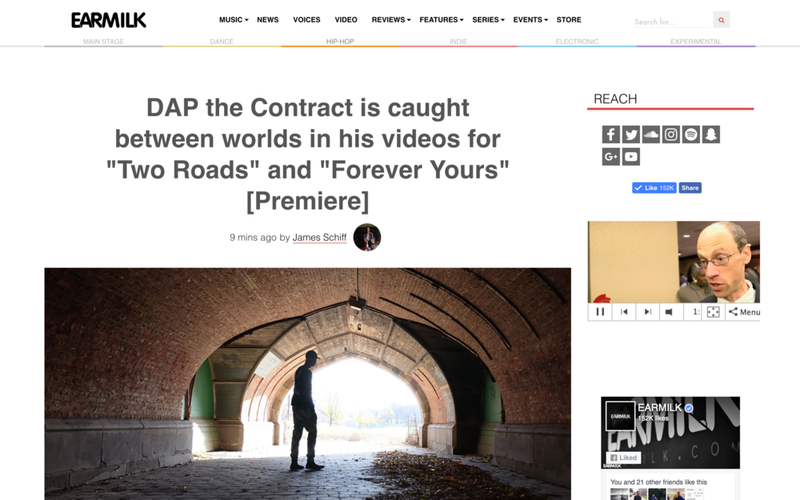 "DAP THE CONTRACT HAS QUIETLY SPENT THE LAST MONTH DROPPING PHENOMENAL MUSIC"
dap The Contract Tears Down Brooklyn Stage! A tear-jerking tribute to the youth we’ve loss to war and violence. From the child pianist Dolapo, to the campus-famous DAP recording from his dorm room, to the newest addition to NYC’s exciting roster of up-and-coming artists, the question remains: who is this kid? One would inevitably fail to accurately define or describe this seemingly enigmatic musical character without sufficient elaboration from the man himself. Luckily, Friends of Friends sat down with DAP to talk about the creation, struggles, and gift of a mixed cultural and musical identity. Dolapo Akinkugbe was born in Nigeria, classically trained in piano and attended boarding school in England. Now he’s a senior at Brown, set to pass through those vaulted Van Wickle Gates in the spring. Law school may be in his future, but so might a career in music. 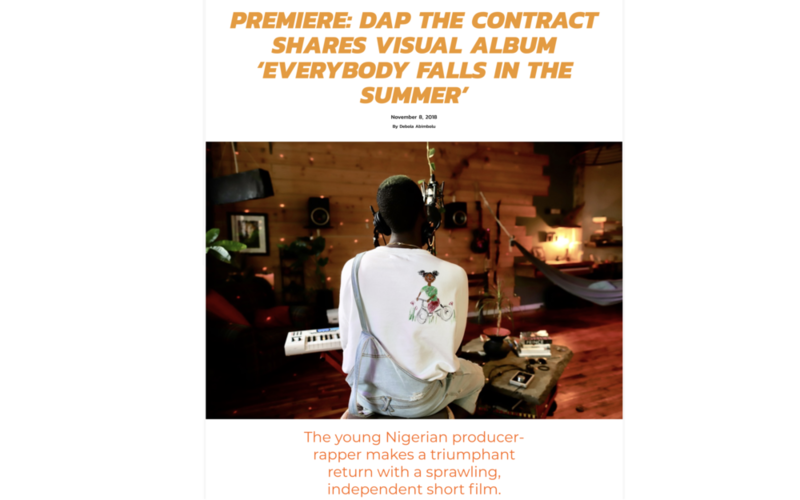 Known on stage as DAP, Dolapo is a rapper who was selected by Converse Rubber Tracks last fall for an all-expenses paid recording session in an iconic studio with an influential producer. His experience was captured in an online documentary released by Noisey on March 2 called The Undergraduate, as he juggled familial expectations and school with the opportunity to record at Abbey Road (yes that Abbey Road) under the guidance of “Uptown Funk” producer Mark Ronson. In anticipation of his final show as an undergrad last Friday, we got to sit down with Brown’s own Dolapo Akinkugbe. Dolapo, who performs under the name DAP, took his talents downtown to Colosseum for “The Last Class”–a name honoring the first song he ever performed at Brown and, simultaneously, the end of his four years in the PVD. Talking to him before the show, Dolapo was animated yet calm. His earbuds dangled from his t-shirt collar, ready to get back into his pre-show ritual at moment’s notice. We chatted about everything from Mark Ronson to UK grime to the best advice from his dad. Dolapo Akinkugbe ’16, whose musical career took off at Brown and has brought him as far as Abbey Road Studios, is ready to reflect on his undergraduate years as he looks toward the final performance of his collegiate days. Classically trained musician DAP – Dolapo Akinkugbe – recently worked with Mark Ronson and Ken Scott at Abbey Road Studios as part of Converse Rubber Tracks. @DAP_TheContract speaks on HipHop music, critical race engagement, and empowerment to @PaulCuffee. In the case of Nigerian-born classically trained pianist and emcee Dap, the studio is Abbey Road, and his collaborators are Mark Ronson and the legendary Ken Scott. Ronson needs no introduction, and if you’re unfamiliar with Scott, I can guarantee you know his work. Allow me to do your googles for you: the guy—ahem, legend—has been an in-house producer at the iconic Abbey Road Studios in London for decades and has worked with everyone from The Beatles to David Bowie to Pink Floyd. Yaknow, just to name a few, nbd. Converse Rubber Tracks, the brand's global music project, has announced the list of 84 up-and-coming artists from 28 different countries who'll be recording a track at one of 12 studios worldwide. Not just any old studios, however: the list includes Abbey Road Studios in London, L.A.'s Sunset Sound, as well as Tuff Gong in Kingston, Jamaica. The project begins next month, on 14th September. UK artists involved include Denai Moore and AZEKEL. "This Converse Rubber Tracks studio takeover is the biggest thing we've done for the platform to date," says Jed Lewis, Converse Global Music Marketing Director, "and we're thrilled to have reached so many local music communities worldwide in just the registration period alone. "We received an incredible response from such a vast pool of talent, and we look forward to providing this unique platform to new, diverse acts from all over the globe within these twelve iconic studios." So starting from next month, these emerging artists will have a chance to record original music in an iconic studio with the experienced Converse Rubber Tracks team, something that over 900 artists have had the chance to do since the project's inception back in 2011. Read the full list of performers here. The musicality hits you in phases. 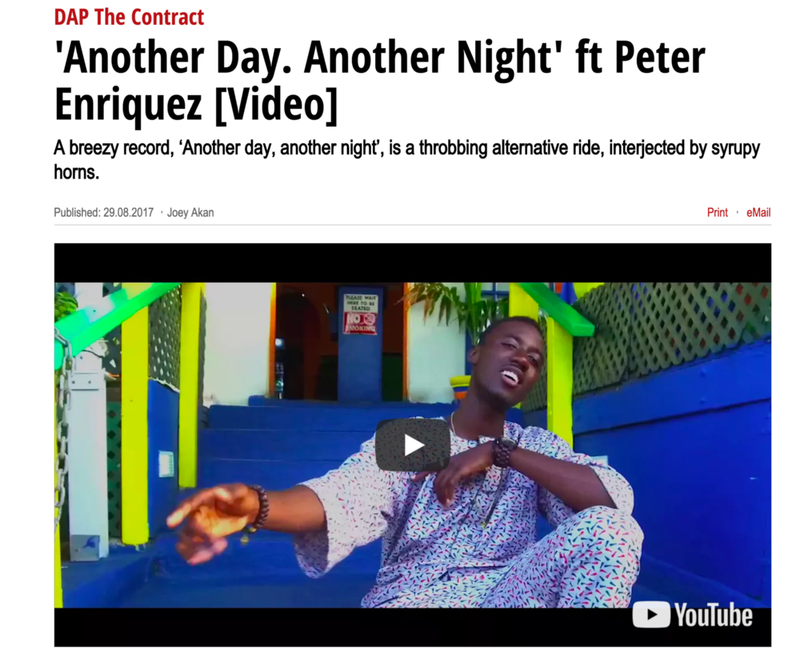 Maybe first you’ll be impressed by the subdued nature of the instrumental, the moody and tranquil crooning, or maybe it’s the right-on-time saxophone that accentuates the outro on “Blue.” Whatever draws you to some of the records on Goodbye For Never, chances are it’s Dap’s own doing. Here’s a little background information on the young, dynamic artist. Born in Lagos, Nigeria, and coming from an entirely musical family, DAP started playing the piano at the age of 4, passed his ABRSM Grade 8 Piano with distinction at 13, and went on to attain a DipABRSM Performance Diploma on the Piano at 17. After high school in London, U.K., he attended the Berklee College of Music for two semesters as part of a gap year, with the intention of majoring in Contemporary Writing & Production or Music Production & Engineering. On his departure after the summer, DAP released a mixtape titled GoodBye For Now. He now attends Brown University in Providence, Rhode Island, where he majors in Classics & Computer Music. He has performed at Aurora, AS220 and Brown University (Providence, RI), Harbor Point and Eko Hotel (Lagos, Nigeria) with Bez Idakula, a well known artist (guitarist/singer) in Nigeria. He released his fourth mixtape GoodBye For Never, a sequel to GoodBye For Now, on October 27th, 2014. In late December he put out a joint project entitled Jam On Scones with Shane Chubbz under their duo moniker The Contract, for which they had a release show on November 29th in London at the renowned Saatchi Gallery. 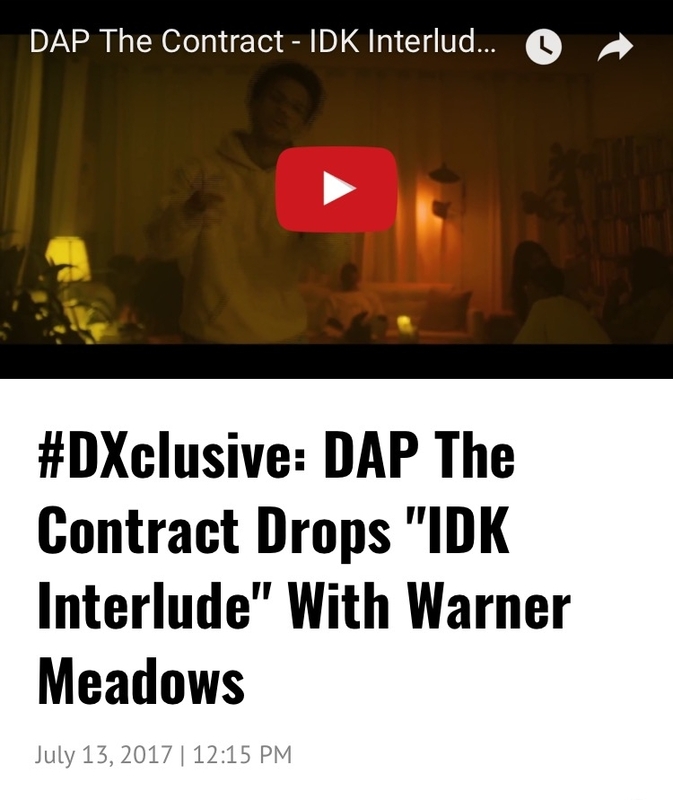 One of the most interesting things to think about when listening to Dap, is how little today’s artists pay attention to sonic detail, and how the young Nigerian focuses on avoiding that pitfall in his own music, aside from the fact that lyrically, he’s much more refined than most expect him to be this early in his career. From the twang of the minor chords on “Blue” to the out-of-nowhere organ uprising on “Baby Please Come Home,” there isn’t much left to be desired once you’ve perused his musical palette. We invite you to do so below, and watch out for this young man, and listen to Goodbye, For Never below. Often times, for as colorful and diverse as Hip-Hop music may appear, there is a constant cry for more originality. There are storytellers, social activists, party-starters, and technically-savvy lyricists, but the genre arguably misses the eclecticism and diversity among the new class, at least at a certain skill level. A Brown University student named Dolapo Akinkugbe is trying to combat the notions that uniqueness is lacking amidst the new class. 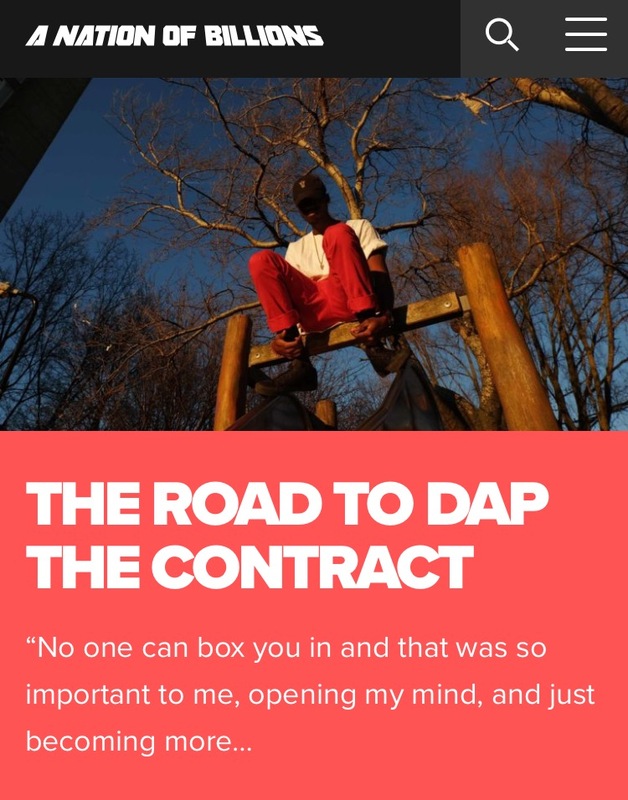 Known as “DAP (Dolapo Akinkugbe Productions) The Contract,” the artist may be a “producer first, and a rapper second,” but he emulates the hunger and drive of someone in this state of Hip-Hop that is distinctive and creative in his own right. Born in Lagos, Nigeria, DAP learned how to play piano at age 4. With his mother as a keyboard instructor, Dolapo comes from two musically-gifted parents. At boarding school, Dolapo took to the art of rapping as a teen, finding his said calling. A standout amongst his friends, he was the one in the group to really explore all of the elements of music. “I listened to everything from The Beatles to Eminem. From 50 Cent’s ‘Candy Shop,’ to UK House and Jazz,” he reflects. Rap afforded DAP a passion for the word. “I learned how to rhyme my words in English class, and from then on, it’s been my passion.” His music likes span from listening to John Lennon in the morning, to bumping Gucci Mane by night. After school in London, Dolapo crossed the Atlantic to Berklee Music College in Boston, Massachusetts. “While I was in Berklee, I got that Jazz influence that you hear in some of my songs,” the MC states, of the prestigious institution. After he attended Berklee for two semesters as part of a gap year, DAP enrolled at Brown University in nearby Providence, Rhode Island, where he will be an upcoming senior after the Spring 2015 semester. Akinkugbe’s creativity appears limitless, and his range as an artist spans from Jazz to Drill music. When it comes to “boxes and categories,” Dolapo waves off labels. He feels as though the type of artist he is, and the “breath and range he has makes him feel like he can make any kind of music.” For example, on his latest single titled “HEAV7N,” there are two parts to the song. The first part, DAP considers a “mini opera,” with some heavy bravado and soaring sopranos thanks to the vocal contributions of his featured artists Peter Traver, Jordan Schulz, and Tasj MelRose. The second part he showcases it as “ATL Trap music,” with some Travis $cott-like elements at play in the mix. He explains the reason why he produces his tracks so variably is a way to get people to listen and appreciate genres other than Hip-Hop. “My mission is to polarize people, where I want them to listen to anything. My friends don’t really like the first part of my new single, but they love the second part. Whereas my mother loves the first part of the track, and she dislikes the other half.” In theory and in substance, most of his work aims for depth, with stories about love, money, power, and corruption. In a discussion about peers and influences, DAP placed three prominent figures into their own interesting categories. “I think Drake is the best songwriter. Kendrick Lamar is the best rapper, and J. Cole is the best storyteller.” Notably though, Dolapo says his favorite rapper of the moment is actually Ab-Soul. When it comes to other outside projects, Dolapo never stops working. He is part of a duo called The Contract with his cousin from London named Shane Chubbz. They have a project out called Jam On Scones, which channels retro-UK House music that demonstrates their abilities to flex their lyrics over sounds unlike their respective solo work. Dap the Contract is a rapper/producer born in Nigeria, raised in the UK and currently residing in Providence, Rhode Island. Showing his talents as both a producer and lyricist, “Heav7n” is a new track from Dap that expresses his understanding of the bigger picture. To hear more from Dap, check out his latest mixtape, Goodbye For Never, on his soundcloud. Due to circumstances not under my control I’ve been sitting on DAP’s latest project Goodbye For Never, a few days now, but I’m putting things right, giving it to you on this hazy Sunday night. The transatlantic, emcee/producer (all encompassing creative) has been on mine and Versus’ radar for a while now, but what he manages to achieve with Goodbye For Never exceeded all of my expectations. Theres so much going on in this EP, although it never really strays away from its’ three core elements: soul, hip-hop and great rap. Be it the opening number Goodbye, that has a delightful hook by Abbey Perrault that will have you grinning from cheek to cheek as DAP opens up with a damn cool monolgue before turning up things to 11, or be it the already released KING that see’s DAP at his free-flowing best. This EP has something for everyone. Now if you only listen to two tracks on the EP make them Baby Please Come Home and Corruption. Between these two, he manages to encompass all the things that make him an artist to watch for. On Baby Please Come Home, we have an iconic jazz sample paired with some WTT for good measure over which DAP performs as if a Jazz artist putting so much focus on his diction and delivery, switching up his flow exquisitely, making it at one with the instrumental. Then you have Corruption that has an instrumental that could be found in a Cafe in Paris, that proves a worthy backdrop for DAP to flex his whimsical muscles. DAP–that’s pronounced ‘D-A-P’–is a junior at Brown; he’s also a student who does cool things. A producer first and a rapper second, DAP has established himself as a force to be reckoned with, and is rising in his renown on campus and off. After studying for two semesters at the Berklee College of Music during his gap year, Dolapo came to Brown. An enthusiastic piano player since he was a child, DAP has a natural predilection for bringing different sounds into his production style. He matches this with his flexible lyrical delivery (“flow”) and many ideas about the world and his place in it. A couple of Fridays back, DAP rocked a crowd at Aurora in downtown Providence. The following Monday he dropped his fourth mixtape, GoodBye For Never, which demonstrates his versatility as a musician (he casually produced every track on the album, by the way!) and great ability as a lyricist and thinker. This week I had the pleasure of sitting down with DAP and asking a few questions about his music and plans for the future. Kanye West immediately comes to mind, simply because he’s a complete artist. I also think he’s the best performer of all time, alongside Michael Jackson, and maybe James Brown, Beyonce. My favorite songwriter is Drake, the best rapper and lyricist in my mind is Kendrick Lamar. And I’d say Ab-Soul is the most intelligent rapper. I can tell that he’s both book smart and street smart. And then I’m influenced by anything immediately around me, like A$AP and Gucci Mane, and I’ve taken influence from The Beatles and Motown, Stevie Wonder. For example, I’m going to a Stevie Wonder concert in a couple of weeks, but in a few days I’m going to Ty Dolla $ign, Lil Bibby and Jeezy concert. And I’m also going to YG and A$AP Ferg. So anywhere I get inspiration from I take it. What are you studying at Brown? Classics and I’m hoping to double concentrate with Music. Would you like your style to evolve and if so, how? One thing I make sure I never do is get boxed in — but that’s immediately in my nature simply because I’ve been playing the piano since I was 4, the classical piano. And now I’m making hip-hop beats and producing, that kind of stuff. So I’m already not fitting into any box. But in terms of my development recently I’ve been starting to listen to a lot of house, a lot of lounge house music. I’m always trying to pull other genres into the hip hop category; I’m interested in these sub-genres. I’m also listening to a lot more James Blake and Bon Iver. I’ve come through Nigerian highlife and afro-music, and being in London for 8 years, house music, lounge house, UK garage, grime. So I’m looking forward to more songwriting basically, because I never wanted to be a rapper in the first place. I want my style to develop sonically because I’m a musician first. And I want the sounds to become very organic and different: ‘keep you on your toes’ kind of thing. When do you feel most fulfilled as an artist? Being on stage. I haven’t performed a lot because I haven’t developed too much as an artist yet. But anytime I can perform and share my music with other people, I’m really happy. And hearing people play your piano chords out and add lines or melodies to them, that’s one of the best feelings. What would you like to see more of in the music scene at Brown? Peer support for music and art in general on campus. At Berklee I collaborated with one kid, maybe two. Here I’ve collaborated with six. The a cappella groups are strong. The school groups, like Jazz Band, Orchestra, and Choir are as strong as well. But individual kids are amazing here, as good as some of the musicians I knew at Berkleee. People know them more as extensions and extensions of friends though—it’s not people really seeking out good music and supporting each other. So I think there needs to be more knowledge of who the musicians are on campus, especially if they’re doing it off their own back, without the school’s support and stuff like that. Clyde Lawrence for example, who was on my last tape, goes to Dartmouth to play shows with his band. With publications like Unhemmed Magazine and events in the Underground, we’re starting to get a little more drive now. Word of mouth is the strongest thing. People talking about things, telling their friends. I’m as obsessed with football (soccer) as I am with music! If you could collaborate with one artist who would it be? Kanye West, every time, all day, every day, because like I said before, to me he is the most complete artist of all time—in terms of performance and actual performance technique. Visually too—he directs all his videos, and works down to the tiniest part of his album artwork, and down to the tiniest snare on every track, to make sure everything is perfect. He’s as much of a perfectionist as I’ve ever wanted to be. Just pure artistry in every single part. You’ve finished your EP. What are you working on now? I’m working on a 5-track EP with my boy from home Shane Chubbz. I’m flying back to London during Thanksgiving for the release show for that. It’ll be, we’re hoping, at this dope art gallery called the Saatchi Gallery in Central London. Same kind of vibe as The Jay-Z video for Picasso Baby. Besides that just a lot of collaborative EP’s: I’m looking to do a compilation with four separate, smaller, 3-4 track EP’s, each with a different concept, or sound or vibe. What I’m trying to do is divide my sound up. Because on this tape [GoodBye For Never] there’s a lot of sounds, but sometimes it’s a lot to take in, so I’m trying to find a way to structure all that. Thinking to do one with Ryan Glassman, maybe one with Clyde. Sooner rather than later we’ll link up. And this post would be incomplete without a note on DAP as a person. If there’s one thing that he hasn’t gotten from Kanye, it’s an idea of himself as perfect. 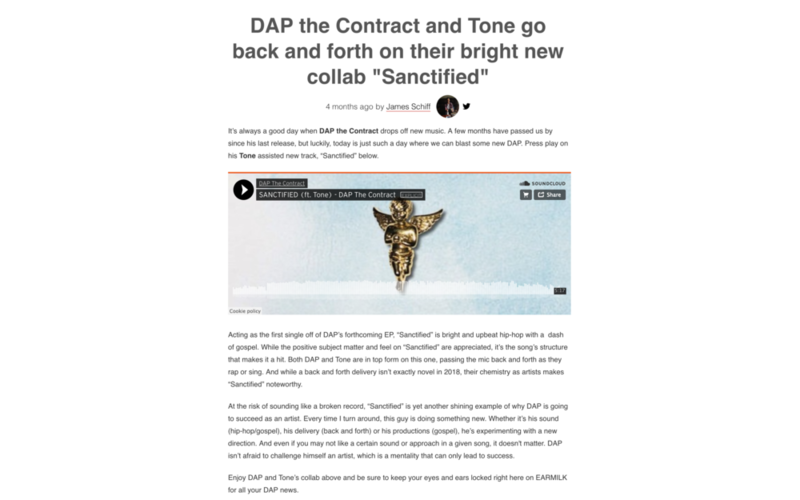 DAP said himself that he knows he has “a long way to go.” With soulful deliberateness he delivers his music, and his humility is steady as it is natural. This quality gives a friendly equilibrium to his artistry, one that’s sometimes hard to come by. Look out for DAP! We have a feeling he’ll be making more waves in hip hop. And give him a follow on Soundcloud here if you’d like.